Over the course of the last weekend, I sat through approximately 9 hours of liturgy before I could receive communion: 3hrs for a Roman Catholic bishop ordination, 3 hrs for Armenian Christmas Eve, 3 hrs of Orthodox divine liturgy. By the time I rolled to my own church on Sunday evening, I was hungry. I’ve gone for days before without receiving communion- why was last weekend so hard? I’ve experienced “ecumenical awkwardness” before, but this was different. It wasn’t awkward. It was painful. Through all those other liturgies, I watched faithful brothers and sisters step forward, a line of hungry people poised to receive the life-giving elements. I wanted what they had. I wanted to feast with them. I was present and visible at all those services as a sign of the wider Church, and yet again, could not fully participate as a sign of that wider Church. And in full disclosure, I was a bit worn from the holidays and needing spiritual nourishment myself. I was hungry and could not eat. When I visit congregations and ask parishioners when they feel the divisions of the Church, invariably someone speaks about the pain of being unable to receive Communion, most often at a funeral, wedding, or baptism. This happens far more often than we worship leaders think; our congregations are less homogenous that we imagine. How would we change if we expected guests who could not receive at every celebration? In both the Roman Catholic and Orthodox settings, my hosts took steps to acknowledge this division and care pastorally for those who could not receive. I commend these options to you. The Guidelines go one to delineate the churches with whom Eucharistic sharing is a possibility. The printed guidelines also serve as a reminder for all who can receive that there are others worshipping with them who cannot. In the Armenian Orthodox setting, as an ecumenical representative I was seated near the altar with the retired clergy who were present but not presiding. The presiding priest sent a deacon to us with “blessed bread” or “mas.” The blessed bread is distributed “in order that the faithful, who have not received the sacrament, should not be deprived of the blessing, but should have a sense of sharing in the Divine feast.” While this practice is not necessarily an option for all churches, every church can have its leadership be attentive to visible and less visible guests who cannot receive. Most of the Protestant churches I visit are very explicit and expansive in their welcome to ‘eucharistic hospitality.’ And yet, as wide open as these churches can be to invite others to the table, not all are able to receive that invitation because of the directives of their home churches. Just because we invite doesn’t mean that all can attend. There is still plenty of reason to include a written or oral prayer that invites all to pray for the day when everyone can feast at Christ’s table. 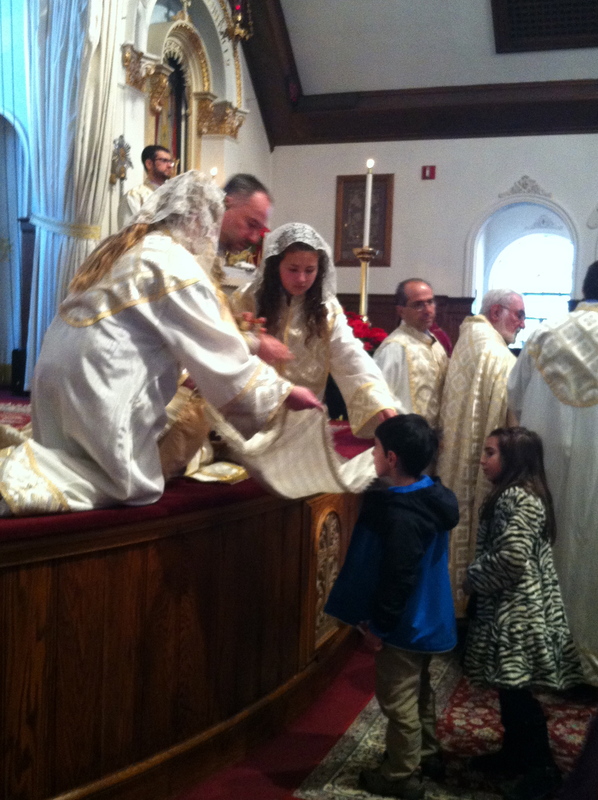 Holy Communion is a sacrament of the Church throughout the ages. We invite our interfaith friends to observe our sacrament and pray that we may grow to understand one another’s unique traditions better. This congregation practices an “open table” where all are invited to receive the elements. Yet we know that our churches remain divided around this sacrament. We invite those Christians unable to receive today to pray for the conviction and work we must do so all can come to Christ’s table. ~ prayer from Receive One Another: Hospitality in Ecumenical Perspective, Editor: Diane C. Kessler. This book project was initiated by the Massachusetts Council of Churches and printed by the World Council of Churches in 2005. Maybe we should remain hungry. This is an important beautifully articulated post, Laura. Your official position puts you at great disadvantage when it comes to open Communion because you really do need to follow the rules for a greater goal of ecumenism. Still that doesn’t stop me from shaking my head with dismay at how convoluted that is: let’s strive for ecumenicism and building the Body of Christ by excluding one another. Nuts. You’ve inspired me to write about this over on my blog but here’s the headline: I was raised Jewish and as a baptized Christian believe baptism is my holy meal ticket. This is a thoughtful article reflecting on the sadness and pain of the continuing divisions that keep Christians from sharing in full communion to this day.